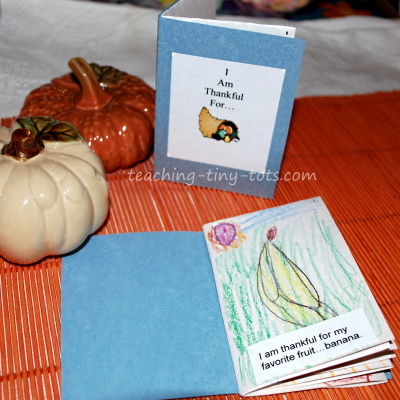 Toddler Books: Make a Thanksgiving Book expressing things children are thankful for. 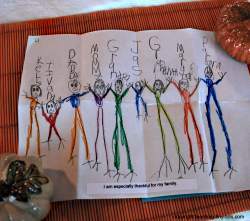 Makes a really cute keepsake and great classroom activity. White Construction Paper 12 x 18 is a great size which is what I used in the classroom. We used an 8 1/2 x 11 inch sized paper for the book shown in the photo. Fold paper in half, fold again in half and once more. When opened, your paper should show eight sections. Fold back into the smallest size. Discuss with your child what it means to be thankful and discuss things that they are thankful for. Write down their ideas on paper for them to see. Often they will come up with items like toys, clothes, books, lovey, food and family. Encourage them to think of special events like going to the park with Grandpa and Grandma. Have them select four items from the list and talk about each one and why they are special. Try to help them form a list in order of importance and fill in the blanks in the free printable worksheet provided above. Hold your folded paper like a book to be opened and label number one on a corner. 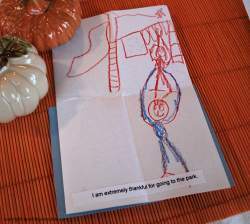 (See photo) Have your child draw the first item on their list. Open your book so now it's still folded into fourths and write the number two in a corner. Have your child draw then next most important item on their list. Open your book so now the paper is folded in half. Write the number three in a corner. Draw the second to the most important item on their list. Open your book so the entire page is now unfolded. Write the number four in the corner. This will be the most important item on the list. If you used a 12 x 18 sheet of paper you can cut and paste the labels you wrote out. We had only smaller size paper so I printed their sentences on mailing labels to stick onto each page. Cut a piece of construction paper to make a cover and back. It should cover the book when it is in the smallest size. Fold up your book. The back should be blank. Put glue on this and stick onto the back cover of the book. Your book should be able to open with each page showing the next picture. Test before applying glue! IMPORTANT Number the pages first so you make sure to draw all the pictures on the right page. The book should open with each picture right side up. If the book is for a very young toddler, you can find pictures in a magazine instead of drawing. If you prefer to simplify the language you can use: I am thankful for..., I am very thankful for..., I am very, very thankful for, etc. As much as possible, write down the words your child says. It only makes it an even more precious keepsake! Be sure to have your child share his/her toddler book with family. It shows that you value his or her work and shows how books express ideas.